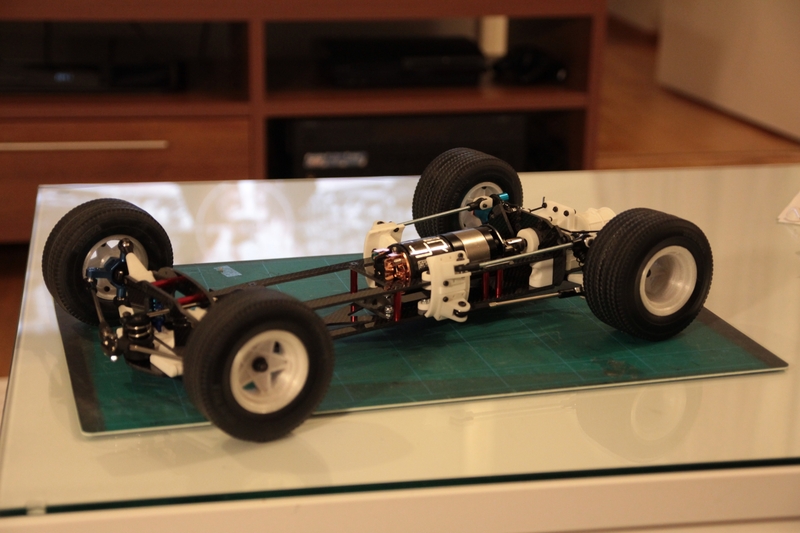 Wow that pile of parts assembled quickly, very nice assembled chassis! 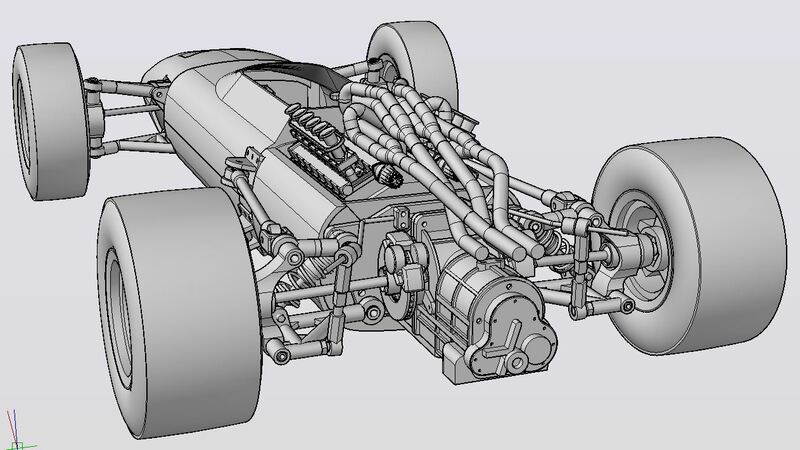 I really like the rear suspension geometry, looks awesome and beautiful stance already with the custom wheels and tires. What did you use for front springs and shocks? I see the upper arms are used as cantilever but we cannot see what is attached to the inside end of the upper arms. Thanks! 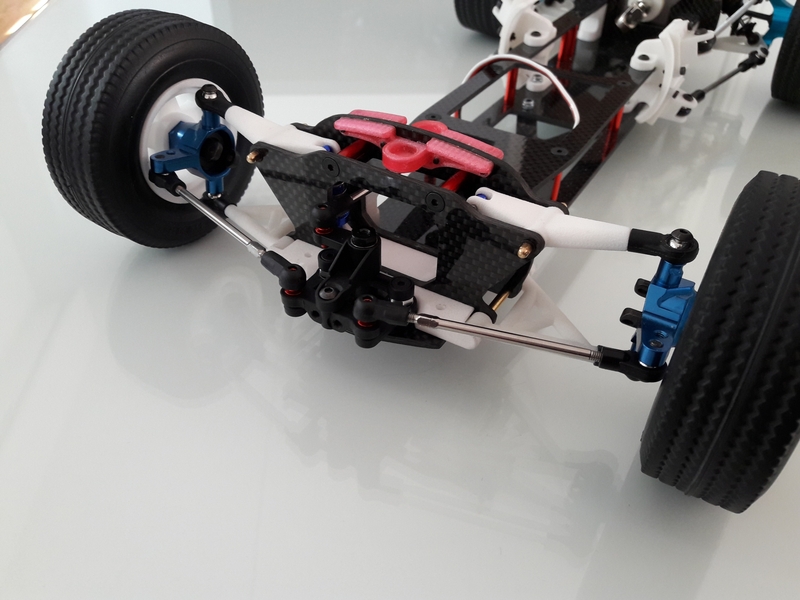 Front shocks are Losi Micro SCT from Hot Racing. They are currently way too soft. I think I'll have to double the springs or at least add heavier oil and adjust the preload. Rear shocks are Latrax Rally shocks. Here's a pic of the set up. 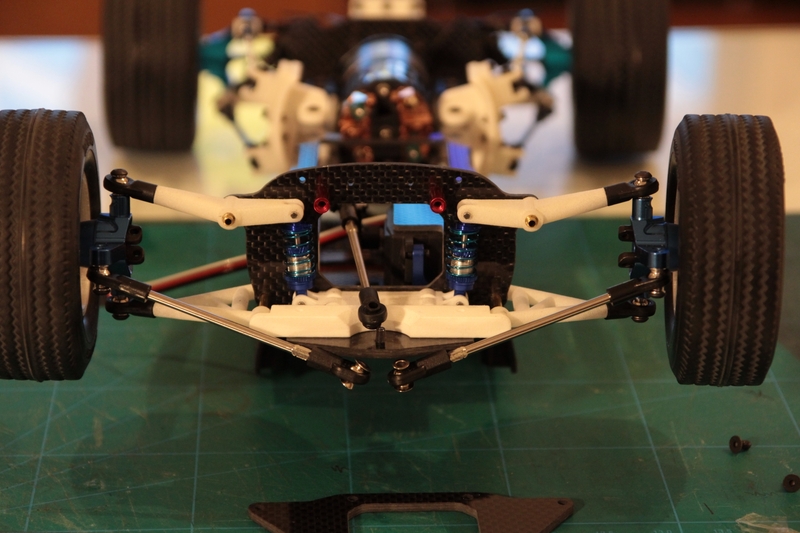 For the front steering geometry, it looks like having the servo saver horn flipped on its pivot to point towards the rear instead of front (and mounted a bit more forward to clear) the tie rods would be angled the other way and would maybe create a better steering geometry. Not sure the servo-to-horn link would clear the right side tie rod though... Or you could try to move the servo saver pivot back, and place it inside the suspension box with only the servo saver end protruding? Thanks for the input but I think I'm now stuck with the current design. 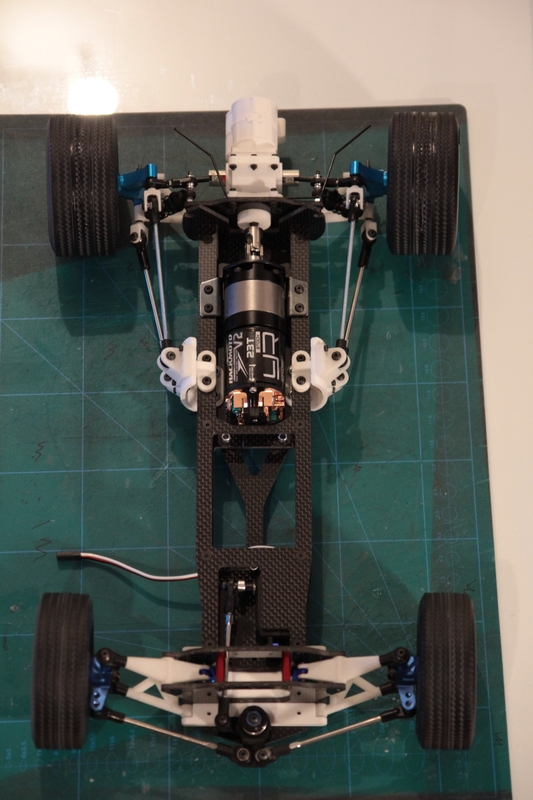 There's not enough room inside the suspension box and I can't really move the servo saver front or back. Front would need a major redesign. I'll see how this goes and if there's problems I'll get back to the drawing board. Thanks! I did spend some time designing this. First I used just pencil and paper and then started tinkering with autocad. I have now fat rear tires and motor on. Looks like a giant slot car. With extra bits, like steering... Well done. Very impressive! love the design and execution! All those specifically build parts look awesome assembled! 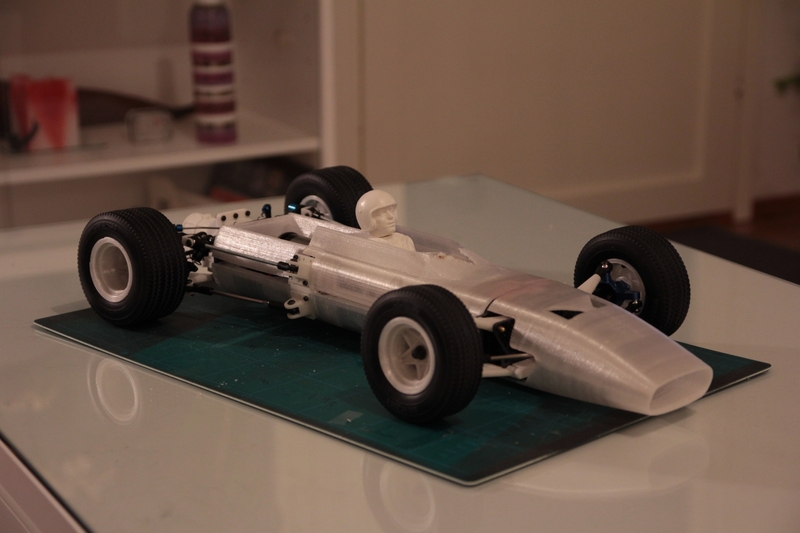 All the body parts are now printed but the fit is not good. I'll have to tinker with the design a bit but I might not try to get these parts working. 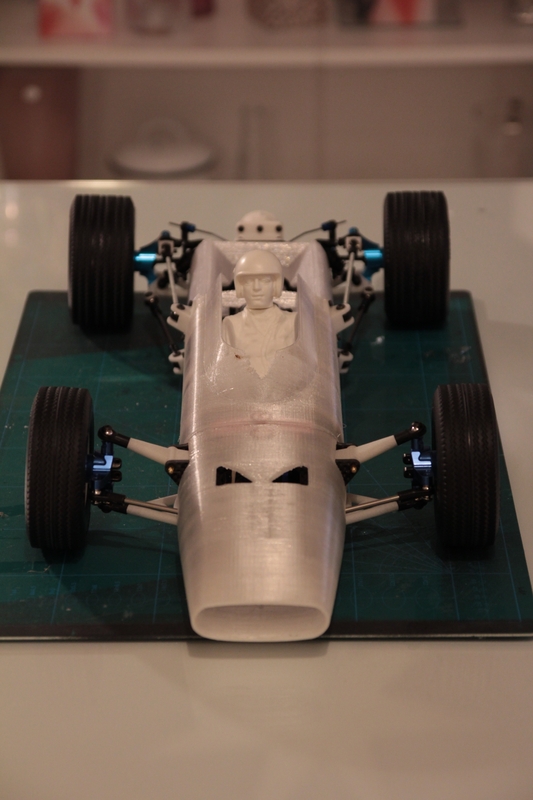 I have now access to a resin printer so the new plan is to buy some nylon like resin and reprint the body. Whatever the plan. This racer is gorgeous. Well done! So well engineered, body lines look so period correct! And I think it's time to update this build thread a bit. I have now different steering set up. I bought the FGX Evo steering set and installed it. Rod angles are better but still not the best. With a little bit of CAD work I could design a part to go with the FGX parts and get the angles even better, but I think I'll go on with this set up. 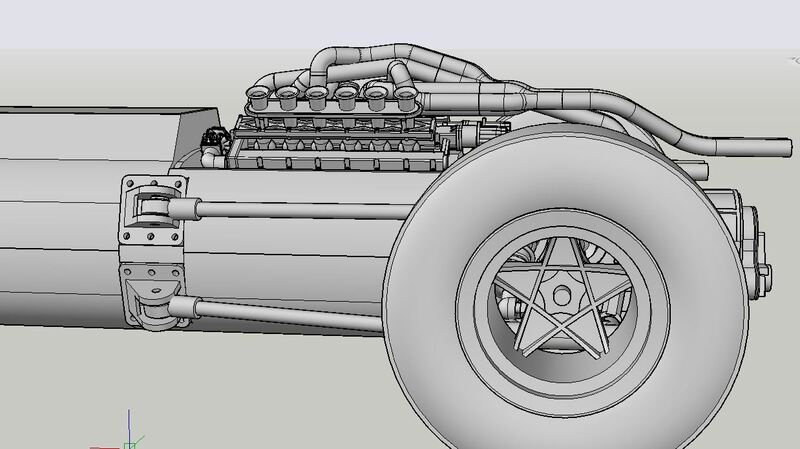 I have also modeled the V12 engine from the real thing and the spaghetti exhaust piping too. Not prefect work but it will look killer once printed and painted. 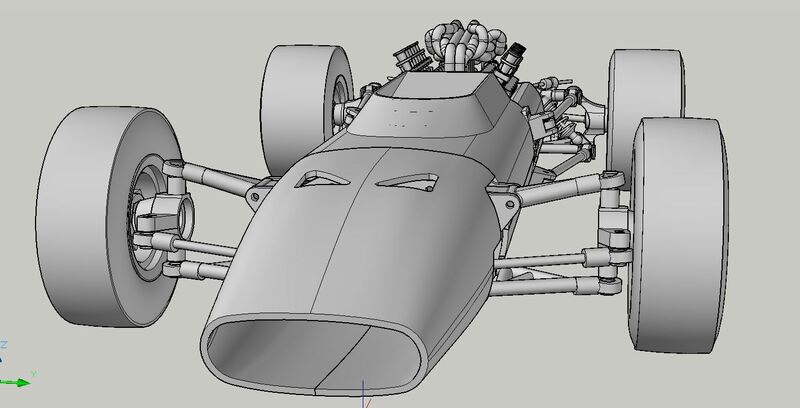 Few details here and there will be added and there will also be a heat shield between the piping and the engine and I'll make it from thin brass sheet.